Every Friday Josh makes pancakes. My role is to stay out of the kitchen, no micromanaging, no helping. Receive, receive, receive with a grateful heart. This is easy right?! Well I wish it was as easy as it sounds. I’m learning that receiving is something that you have to learn or even practice doing gracefully. While I was overwhelmed with gratitude I simply couldn’t keep up with thank you notes, or reciprocal acts of care. I simply had to receive. In my faith, receiving and enjoying God is what I believe is the only requirement to being in his family, yet how often do I try to earn or perform without even realizing it. We are given the example to be like children and children are the best at receiving, in fact that’s mostly all they do, and in return occasionally give back gratitude and love. I entered into an obvious lesson this year of receiving well and enjoyment of God and his generosity through all of the care we received. I’m hoping this lesson will stick with me and I can carry on the idea into my marriage and other relationships. 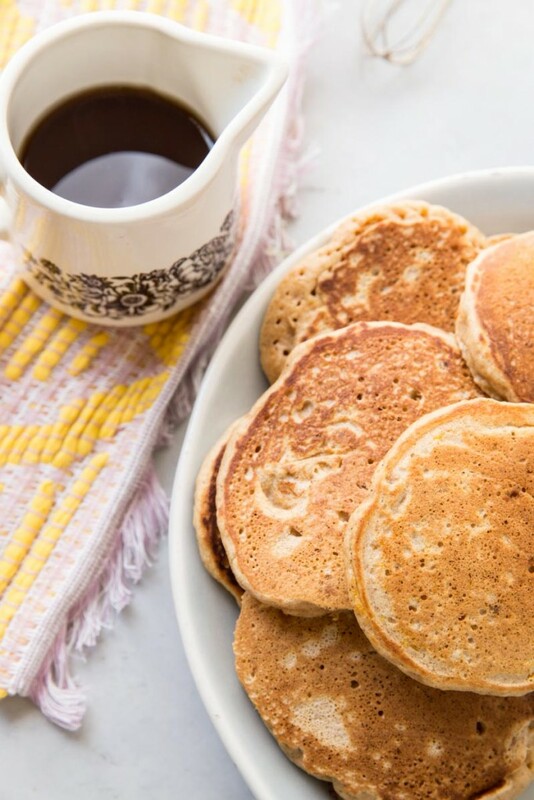 Sit, enjoy the pancakes, don’t lift a finger, receive. 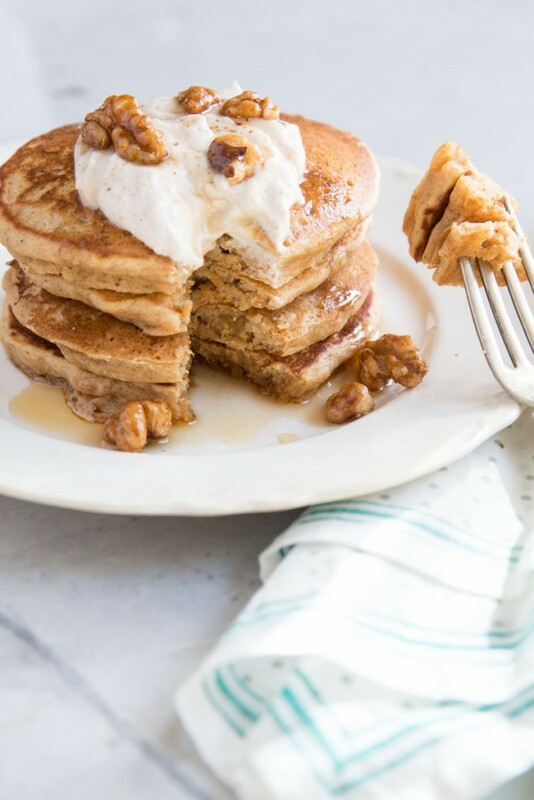 Fall spiced carrot cake pancakes served with whipped ricotta, honey glazed walnuts, and maple syrup. 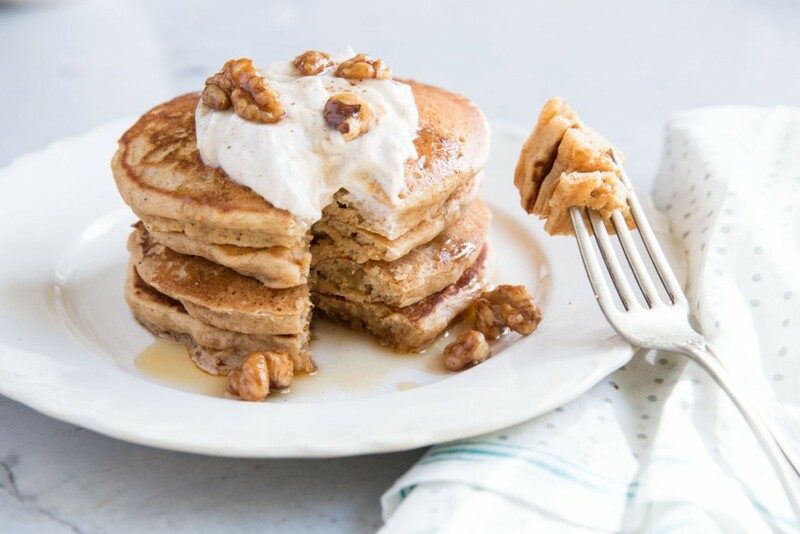 Mix together all of the dry ingredients - flour, brown sugar, baking powder, salt, and chopped walnuts. 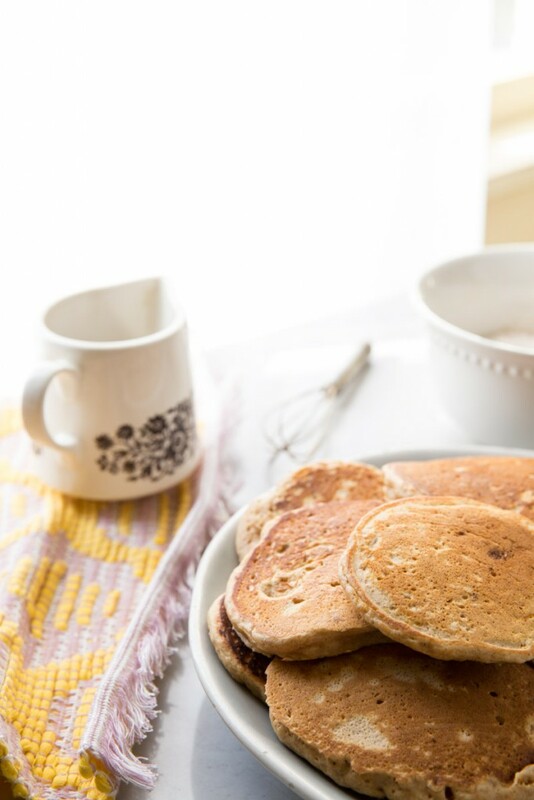 In a separate bowl mix together the spice blend and add 2 teaspoons to the dry ingredients of the pancakes. 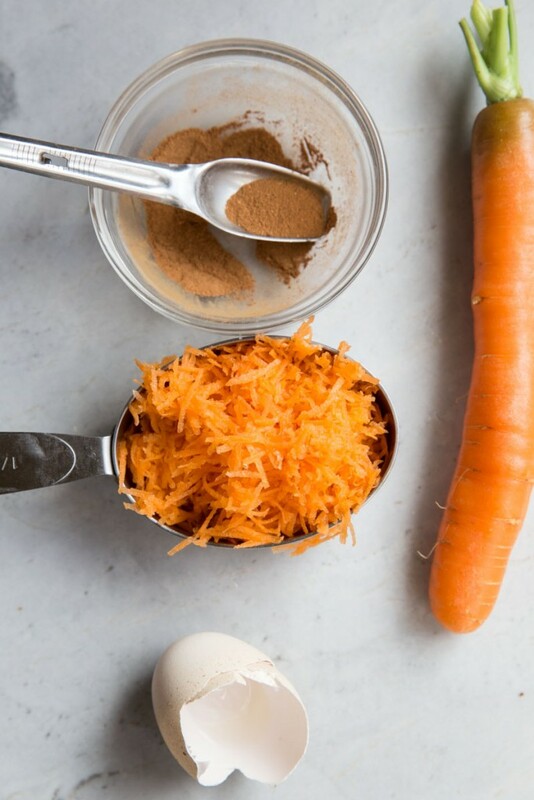 In another bowl mix together wet ingredients - milk, eggs, oil and grated carrots. Add wet ingredients to the dry ones and stir well using a spatula or wooden spoon. Heat up a large skillet over medium high and add a little oil or butter to the pan. Spoon our pancake batter by the 1/4 cup full. 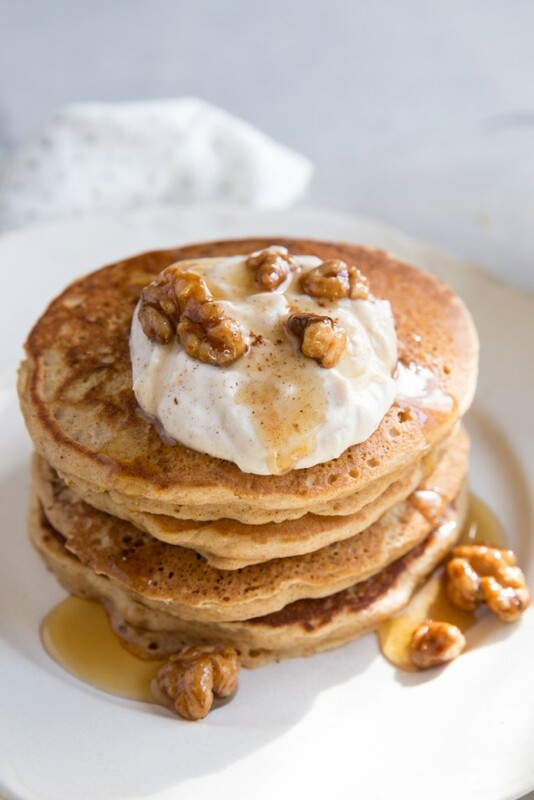 As you're cooking the pancakes, make the whipped ricotta. Place ricotta, honey and 1 teaspoon of the spices to a bowl or mixer. Use a hand mixer or stand mixer with whip attachment to whip it all together. Taste and adjust seasoning and sweetness to taste. I like mine a little less sweet since we also pour maple syrup over the top. 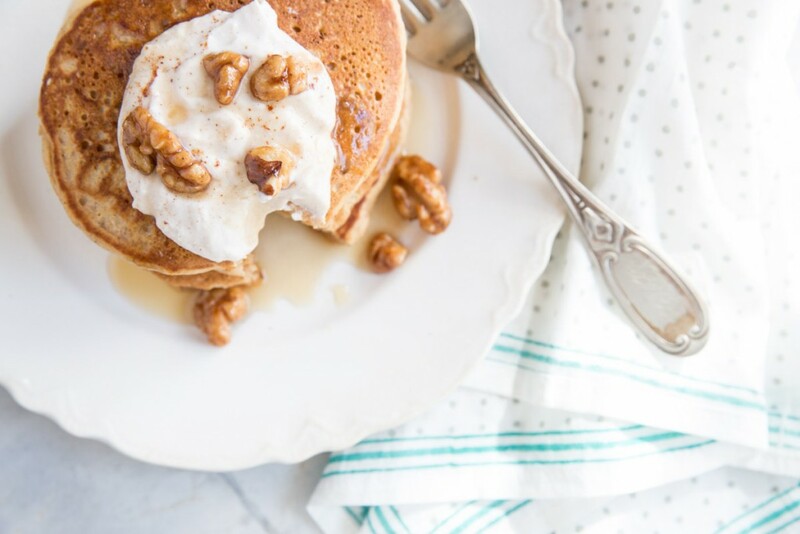 For the honey walnuts, place a small skillet over medium heat and stir everything together using a small spatula. Keep toasting and stirring the nuts until they're all covered in honey and the honey starts to dry or crystallize a bit (2-3 minutes). Transfer to parchment paper to let them cool and dry. 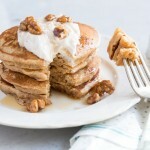 Serve hot carrot cake pancakes with whipped ricotta, honey glazed walnuts, and maple syrup. If you don't prefer to use ricotta or just don't have it around your house you can use Greek Yogurt, Cream Cheese or Mascarpone Cheese. If you use one of the other cheeses you may need to thin them out a bit with a little cream or bring them to room temp before whisking the spices in. Also, for the spice blend feel free to use what you have, even if its just some cinnamon.